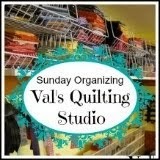 I have only one plan today: to be in my sewing room! I have those many pieces to prepare and cut for my Modern Rings Quilt. 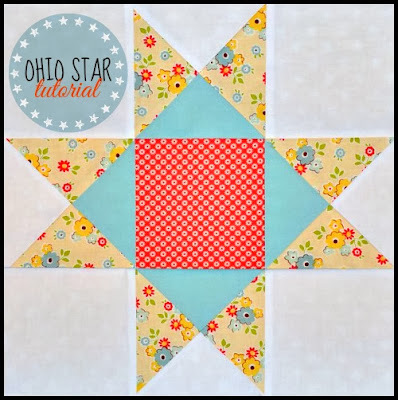 I want to prep my Polka-Dotted Pinwheels Flimsy to quilt next weekend. And I plan to enjoy some slow-stitching while watching the Oscar's tonight. All the while, I know I'll also be thinking of what "finishing touches" I want to add to my studio make-over that has been a WIP. I had been feeling overwhelmed with "clutter". And when things get cluttery, I feel less creative. found myself reevaluating how I was using my space. I geuss you can say, instead of Grammy's Sewing Studio being hands off, we also wanted to create a cozy/inviting area that would accomidate family visits as well. So last Fall we took everything out. Now THAT in itself was rejuvinating!! I didn't even mind sewing in the livingroom for awhile. My darling husband painted walls and added paneling. This half of the room in designated as my sewing area and I already love the clean "feel". We traded a large recliner for a family sectional. I reorganized and got rid of anything that didn't have to do with sewing. (That glass bookcase was filled with cookbooks, yearbooks from my college days and daughter's highschool years as well as stuff I forgot I even had and didn't need! LOL!) Now my quilting books, fabric and notions fill this beautiful bookcase. I don't feel like it's finished and have hit a creative block. I'm looking forward to getting ideas from this week's Tuesday Archives Organizational Theme, but if you were my neighbor and we were sitting together stitching, what would you tell me it needs? Find a large round rug for under the table. Create fun pillow covers to carry the reds, blacks and dots over to the couch area. Recover large and small ironing boards. Charm hubby into making another quilt ladder. The rest of the fabric is from my overflowing stash of polk-dots. I need to sew 96 of these pieces...four down and 92 to go. Oh my! Geuss you know what kind of piecing I'll be up to until our next class on March 11th. From this pile of scraps to this colorful flimsy below...what fun I've had creating this quilt top! I took Jane's advice and auditioned all your recommendations for my sashing. I found out what Sharon meant when she said the blacks might muddy the colors. Ruth recommended some small dots and when I auditioned this bright white with its small black polka dots the pinwheels just popped! I loved it! Karen I tried my text prints, but they weren't all a bright white. (Darn it!) And, Cynthia I did try the stripes but, they made me dizzy!! LOL!! We are having unseasonable mild weather right now so I have to admit is was nice to be outside taking pictures today. (Thinking of all of you back East...especially in Massacusetts.) And as you can see by Jackson's stance the squirrels are out too! Thank you all for taking the time to comment. As you can see, your input really helped! I can't wait to get this one on the longarm. Hmmmm....wonder if I can find a cupcake pantograph? 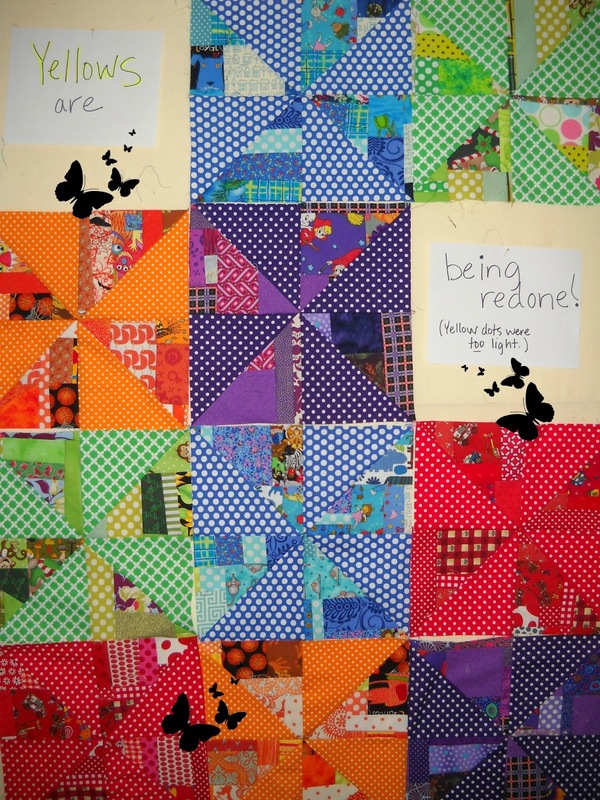 Isn't it fun to see a pile of scraps be made into a quilt! Any suggestions for the sashing? Black with colored polka-dots? White with colored polks-dots? or No dots and go with white text prints or a solid? THIS is what happens when you don't plan a quilt...it just unfolds! LOL!! And it has me constanting...thinking in wonderment! We are six months into our Piggy Bank Challenge and I was asking myself this exact question when I went to the grocery store to get more Sorbet. (My current yummy treat and one of the few foods that likes my digestive system at the moment!) And yes, this fifty-two cents went right into my piggy bank when I got home. I'm actully doing pretty good on my coin savings, but admitably stuff some dollar bills in there too. I sit here looking around my studio wondering what I want?? Maybe a really nice pair of scissors?? I don't know?? There's 35 of us linked up for the challenge. I'm especially looking forward to your comments today to see how you're doing with the challenge and what you are dreaming of doing with new found cash this July?? Maybe I'll get some ideas!